Introducing ImTOO iPhone Contacts Transfer for Mac, the all-in-one comprehensive package for managing your iPhone’s contacts. Back up,restore, import, export, organize, your contacts on iPhone! Never worry about an accidental loss or deletion again. Give your precious contacts a realm of safety with this new release from ImTOO. Packed full of scintillating features, it allows you to manage all your contacts from one place. You can even handle your contacts by importing/exporting contacts in CSV/vCard files from/to Google Contacts, Yahoo Address Books, Outlook, and Windows Address Books. 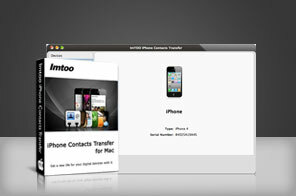 Don’t hesitate, grab a copy and download ImTOO iPhone Contacts Transfer for Mac today! Keep a safely stored backup copy of your iPhone contacts on your Mac! You can take Full advantage of iCloud by transferring your iPhone contacts from iCloud to your Mac or directly sync to your iPhone. Import/export from address books including Google Contacts, Yahoo Address Books, Outlook, Windows Address Books, Apple Address Book, Fastmail, Rediff Mail, Mail.com, Loposte, Orange, Skype, Freenet.de by introducing CSV or vCard(.vcf) format files. Transfer contacts between your iPhone and another iPhone, or from iPhone to other popular mobile phones like Nokia, Blackberry, Android phone, Windows Phone and more. In the event of accidental loss or deletion, never fear, restore your contacts with a click of a button! Sort contacts to better look through the contact information. Save the image of contacts from iPhone to Mac for storage. User search for quick and easy contact finding. Keep a safe copy of your contacts, wherever you are! Clean and easy to use interface makes contact management a breeze. 8 Languages include: English, German, Spanish, Italian, French, Japanese, Simplified and Traditional Chinese. Transfer ANY movie/video/audio to iPhone, download online videos to iPhone, backup iPhone to iTunes/Mac, make custom ringtones. Download YouTube videos free to computer on Mac OS. Convert Blu-ray Disc movies to popular video, audio, image files on Mac OS.